Don't miss this incredible event co-hosted by JNET and Sinai Temple. After dancing on your feet at the Celebrate Israel Festival, cap off the day of festivities at nearby Sinai Temple, where you can sit back, schmooze, enjoy a catered buffet, and be inspired by a special screening of On the Map, a Dani Menkin film. This powerful film recounts the 1977 European (Basketball) Championship won by underdog Maccabi Tel Aviv. 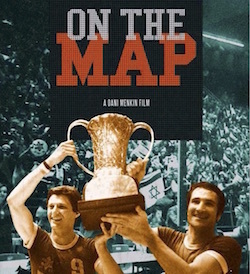 Combining the pulse-pounding action of a high-stakes thriller with an incendiary political background, On the Map tells the against-all-odds story of Maccabi Tel Aviv's heroism battling the traditional European powers. Moments after this highly charged and historic win, Israeli-American basketball hero, Tal Brody, became an indelible part of a young country's history when he said, "Israel is On the Map, not just in sport, but in everything." Witness the spirit of Israel through the nonstop drama and excitement, along with commentary and interviews with basketball icon Bill Walton and former NBA Commissioner David Stern. Meet On the Map Director Dani Menkin prior to the film, which has a running time of 1 hour and 25 minutes. A 30-minute Q & A period will follow the screening. Click the "Register to Attend" button above. Tickets for the film and dinner are $25 for adults, and $20 for guests under 18 years of age. Purchase tickets in advance for our catering count. Tickets at the door will be $30. Checks payable to JNET or cash, which is preferred, will be accepted at the event.